We’re available 24 hours a day, 7 days a week, and we welcome any questions, concerns, or feedback you might have. We’ve made it easy for you to contact us in a variety of ways: call us, send us a message, stop by our office, or connect with us over our social media sites. In the event of a death, you can also fill out our Immediate Need Form to quickly get us all of the information we’ll need to start assisting you with the necessary arrangements. Connect with a member of our staff over the phone, or use our contact form to easily send us a direct message over the web. 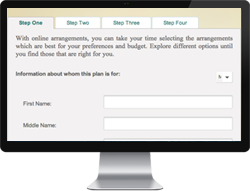 This form is a fast, simple way for you to send us the information we’ll need from you when a loved one passes away. The earlier we receive this information, the sooner we can provide you with professional support and guidance in your time of need.